This past Saturday, I went to the Mercy Conference and Retreat Center with a group from the church where my husband serves. 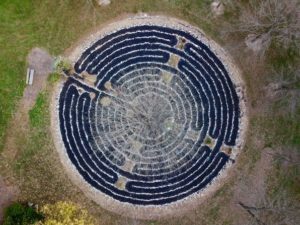 My husband had asked me to help co-lead a labyrinth experience as part of their Lenten journey. On Friday night, Todd was checking the weather and fretting about the fact that people might opt out the next morning because the day's weather reports had changed drastically from warm and sunny to cold and 90% chance of heavy rains. On the morning of the event, Todd sent out a message through their One Call Now system to inform members that the event was still on, but those planning to attend should wear shoes they did not mind getting muddy and to bring an umbrella. When we arrived at the Mercy Conference and Retreat Center, I began to have my own doubts about whether or not people would enjoy the experience. We had designed a worship that we had planned to do outside of the entrance of the labyrinth before we walked it as a group. I couldn't imagine what the worship experience would look like or feel like standing in the pouring rain. I couldn't imagine it being meaningful as realistically the participants, including me, would probably just be thinking about wanting to be back in the warmth of their cars. As we stopped by the receptionist area, I asked if it would be possible for us to use the chapel for a brief moment before we walked the labyrinth. The staff was more than accommodating, showing such hospitality in offering the chapel to us for as long as we would like to use it that day. Even though worshipping in that space was not what we had planned or expected, we reminded ourselves that life rarely goes according to OUR plans, but it always goes according to GOD'S plans. As we walked through the labyrinth under umbrellas, the path was not easy. Sometimes our shoes got stuck in the muddy places. Sometimes in the places on the path were the water had pooled enough that we couldn't simply step over it, we had to decide whether we would walk through it or navigate new ways around it. Our pace was slower and more deliberate in the rain. Our path probably seemed longer and less clear in the cold. Yet after our holy wandering, as we reflected together as a group, sometimes life and sometimes faith is like that. So often we have in our mind's eye how things are supposed to go. We live the experience before it happens, playing out our expectations as well as the roles and rules others and we should live by. We are so determined to believe life should go a certain way, we are surprised, shocked and dismayed that this is not the case. We do not always know how to adapt, accept, and adjust when circumstances change. We argue with reality, with others, with ourselves, and with God when life does not go according to how we hoped and envisioned. We have experienced sunny days, and we are annoyed, frustrated, and even angered when the storms come. Yet, the truth is life can change. The storm can come out of nowhere. A pathway, which was clear yesterday, is unclear and confusing today. Suddenly life is messy. The rains of disappointment and heartbreak, which come at us so fast and fiercely, sting our hearts and spirits. As we slog through the muck and mire, we wonder if our steps will ever become easy once again. As we shiver in the cold, we wonder if we will ever feel warmth again. 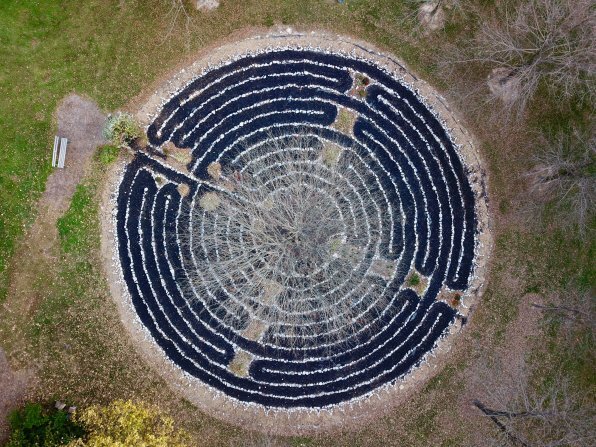 The deliberate walking of the labyrinth teaches us to walk the path set before us on that day at that moment. Even though one day the path may be walked with swift, ease-filled steps, the next day the same path will need more deliberate and cautious movements and decisions. No day is the same. No experience can be duplicated. No journey can be repeated in quite the same way. The challenge always is to keep walking the path, trusting the process, letting go of what cannot be controlled, and remembering we do not walk alone. Labyrinth walking is a beautiful metaphor for life and walking in faith. Walking in faith requires trusting in the Spirit of God to lead in all times, all seasons, and all conditions and circumstances. Walking in faith challenges us to live and be in the now. Walking in faith invites us to remember that whatever difficulty or obstacle we are facing, there is a way around it or through it by relying upon God's grace. Walking in faith also reminds us that no present trouble lasts, for it too shall pass. Whatever you are facing, however the journey appears to you right now, where ever you are on the pathway, remember you do not walk it alone. God is there to guide you, to support you, to hold you, to nudge you and enable you to keep going so that you might experience the grace, beauty, and peace that lies ahead.